It’s that time of year again when the weather outside is frigid and the weather forecast calls for snow, but you find yourself sitting amidst a pile of adorable summer clothes that your child wore just a few months ago, wishing that the sun was shining and the kids were splashing in the pool. It’s Consignment Sale Time!!!! New to selling? Here are some tips to get you started. 1) Check to see if there are any consignment sales in your area. The Bargain Watcher is an awesome site. Giving yourself three to four weeks to get everything in order is an excellent idea. 2) Read your packet carefully! It has important information in it including which way to face the hanger, where to pin the tag, and what items are not accepted. If your sell is registered with MyConsignmentManager there will be information on that as well. 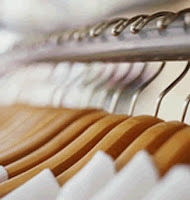 3) Collect Hangers. If you are buying baby/toddler/any clothes at a store that has plastic hangers ask them if you can keep the hangers. Most of the time the cashier is happy to do so as it saves them time. 4) Sort clothes seasonally. Keep spring/summer stuff in one tote and fall/winter stuff in another. It also helps to sort by size as well as some sales have limits on newborn items and/or make you drop off according to gender and size. If it is too small for you child, get rid of it. 5) Keep it clean! Wash the clothes you are consigning one last time. Strangely, dirty clothes do make their way to the piles you want to consign. Take a Magic Eraser and wipe down plastic toys. 6) Purge the stained clothes! Most consignment sales will not accept stained clothes, for good reason. There is nothing worse than getting home and finding that something you just purchased is actually gross. Try to get rid of stained clothes before you put them in your totes/boxes. 7) Price appropriately. No one wants to pay too much money for used clothing. Pricing items at least 50% off from what you paid is realistic. A general rule of thumb is to price items at 1/3 of what you paid for them. 8) Shop early! Many consignment sales offer volunteers first dibs at shopping, followed by consignors. There are tons of good deals to be scored when you are the first through the door. Some sales often let volunteers and consignors shop early for their half price sale as well. 9) Bring cash. You can’t spend what you don’t have! 10) Pick up your unsold items. If you have items that do not sell you have the choice of picking them up or donating them. Some sellers move their stuff from sale to sale or save it for the next year. 11) Have fun! There are many deals to be found at consignment sales. I love bringing my daughter’s on half price day and letting them pick out something small. They think they have won the lottery.